In Champion the first day of Spring was graced by a delightful downpour. Oh! Rain! Rain with no thunder and no big winds or falling hail! Sweet Rain! Soaking into the ground, percolating down to the wonderful water table. Champions are among the truly fortunate people in the world to have such an abundance of good water. Somebody said not to go bragging about it because nothing is guaranteed. True, but then somebody else said that when things are good there is at least as much obligation to recognize it and to talk about it as their is to gripe when things go badly. So. Life is good in Champion. Love and Gratitude abound. Spring is in the air. Manure of all kinds (cow, horse, chicken, rabbit, and possibly others) is being worked into the soil together with ashes and lime, or compost, rotten sawdust, sand, bone meal, blood meal, Epsom salts, clay, sea weed, and/or other things such as worm castings and bat guano where available. Some soil is jut being turned over and other soil is having seeds poked down into it with no other fanfare. Wilburn likes to use the triple seventeen. Whatever the method, Champion is a real garden spot. There is reported to be a recording of James Brixey singing the “No Till” Song. The recording has been misplaced, but as soon as it surfaces the words will be reported here and the song added to the Missouri Song List. Jonathan Swift, in Gulliver’s Travels said, “Whoever can make two ears of corn to grow—would do more service to his country than the whole race of politicians put together.” If Gulliver were to have traveled over to Champion he might have gained some valuable corn raising information and might have spread some good political philosophy. Politics is a touchy subject everywhere in the and a subject best avoided. “Accurst be he that first invented war.” Christopher Marlowe said that in Tamburlaine the Great, Part I, Act 2, Scene 4. There is talk that there will be a war Memorial dedicated to the Civil War veterans buried at the Denlow Cemetery. There are approximately 28 Union Solders there and one Confederate. The dedication is scheduled for Memorial Day of 2008, however the Saturday before this Memorial Day will mark the kick off of the project. The Denlow Cemetery Committee has built a splendid pavilion on the grounds of the church. The cemetery is the resting place for survivors of many wars. As of March 26, 2007 there have been THREE THOUSAND TWO HUNDRED AND TWENTY-THREE United States Service People who have lost their lives in the current conflict. Great Britain has lost one hundred thirty four of its service people. Other Coalition forces have lost a total of one hundred twenty four people. No accurate count has been made of the number of Iraqi fatalities, military and civilian. The current estimate according to . . . is . . . Somebody said, “Hate the War but Love the Warrior.” Just because the flag draped coffins are not being seen on the nightly news does not mean that our precious soldiers are not dying. Champions are full of Love and Gratitude for those who have served and continue to serve Our Country. Wood smoke hangs heavy in the deep hollows flowing in on wind currents like water. It’s hard to tell where it is coming from sometimes. The Forest Service and Conservation Departments do controlled burns on a regular basis this time of year. Firefighters are on alert constantly and Champions appreciate the willingness of those Volunteers to keep the community safe. Champion and its neighboring communities are once again stepping up to be of service to each other. There is to be a Pie Supper benefit for Rita and Larry Hicks on the 21st of April at the Skyline School. They are having some tremendous medical bills. Dale Melton, a friend of the family, had a brain storm and started talking about a benefit and a very short time later it is a ‘go.’ Already there are tickets at the Champion Store and at The Plant Place in Norwood for a drawing on a beautiful queen size Rose Quilt made my Mrs. Violet Melton. The drawing will be held at the Pie Supper. Actually, the supper will consist of chili, Freetos, crackers, onions and cheese. Deserts will be auctioned off from the stage. There is a “Three For One” deal going on. That is to say that the first pie to bring $500.00 in the auction will see a corresponding pie in the face of Van Kelly (or his appointed representative), and one in the face of Dale Melton, and if that were not enough Farel Sikes will take one! These are some solid and sweet citizens. It’s a lovely thing to see people reaching out to ease the suffering of others. It is a heartbreaking thing to be unable to replace the terrible losses that dear friends experience. To build a little home deep in the woods and to raise a family there and then one day to have the woods disappear is devastating. Life goes on, but it will never be the same. Compassion might be appreciated but it doesn’t make shade and a person can see straight through it and watch cars go down the highway. Healing is a long term thing. Let it begin. Three postcards have arrived in the Champion Items mail box this past week. One is from Champion’s friend, Darrell Haden. It is very complimentary and suggests a listen to the song “Rock Salt and Nails.” This came to his mind as a result of the mention made of the Ice Cream Maven from over by Vanzant. Another card came from a far flung traveler out on a splendid musical adventure. From Atlanta, he says, “When you think of me, know that I am prosperous and fortunate beyond measure.” He also noted that the post card was bent up before he put it in the mail. (So the mailman is not to blame.) The third card is kind of a mystery. It must have been mailed from Ava and it is titled “Little Town With A Big Future” Poke Salat Days, Ava, MO. It’s an interesting drawing of people on the square there. The message is: “A family by name of Latent might have lived some distance South of The Wolf Pen Holler some years back. They had a raft of kids and the oldest two were twins—a boy and a girl. Their names were S.T. and Chimmey B. Any information about what has become of them would be appreciated. They stayed mostly to themselves.” There is no signature and no return address. Inquires in the neighborhood among long time residents have been unproductive to this point. Anyone who knows of these folks can contact Champion Items, Rt. 2, Box 367, Norwood, MO 65717, or e-mail to Champion News, or leave word at Henson’s Store in the Mall at Champion. Odes to Spring or to Rain, political perspectives, smoke signals, good neighbor gossip, songs for the Missouri Song List or idle chit chat also welcome. Good news in Champion! A purple Martin was spotted on Wednesday the 14th. That’s a little early for their return (they generally show up around the 21st) but the odd weather and other unknowns have at least one of the wonderful mosquito eaters home for the season. Geese are winging their way north and the red, red robins are bob, bob bobbing along and probably eating tons of wonderful Champion earthworms. They are so plump they might make a nice robin pie. The expected large turn-out for Champion’s First Annual Unorganized, Unauthorized and Unannounced St. Patrick’s Day Parade was a no show. Oh, there was the usual Saturday parade of regulars in and out of The Store throughout the course of the day and there was, no doubt, a mention of the Irish here and there, but the throngs of revelers were no where to be seen. Most of them were out in their potato patches doing what has to be done at this time of the year to make potatoes happen. It was the digging and seeding and the mulching that kept people off the street. There were frantic calls for newspapers from various farmers. Ed Henson was quoted by several regarding the use of newspapers to keep the dirt out of the eyes of the potatoes so they could see to come up. It has been suggested that a Champion Parade Committee should be organized so that a better showing can be made next year. The example set by the Spotted Hog community as reported in the Spotted Hog Yearly Gazette of a number of years ago is one to be emulated. It might be the good luck of Champion to secure Cletus Upshaw’s services as Grand Marshall. He was the official Director of Traffic at the now famous Spotted Hog Christmas Parade and clearly has more parade expertise than any who have so far stepped forward. It will be taken under advisement by the, as yet. unformed committee. A good neighbor and Champion eagle observer suggest that the Ozark Mountaineer is a good source of information for the history and points of interest of this local area. She said that a recent issue had an excellent four page article about the West Plains Disaster including a number of photographs. Its title was “Devastating West Plains Blast Still a Mystery After 79 Years.” She said that the words to the song together with the music were reproduced there. It costs $19.95 a year for six issues of the magazine. Perhaps, when the cost of the sheet music to MY MISSOURI HOME has been recouped and some savings have been accrued, arrangements can be made to get a subscription for Champion. Someone remarked that last week’s Champion Items said, “This is the cover of the Sheet Music…….for MY MISSOURI HOME” and then there was no picture. Well, it is an attractive item including the name of the author, the publisher and the date of publication. The title at the top is written in an old fashioned type-face. Then there is a picture of a farm house with a big porch and some shade trees sitting down kind of behind a hill which is indicated by some curved parallel lines. There is a windmill in the drawing, however, and while that is not representative of this area there may be parts of Missouri where windmills are more common. In any event the sheet music is still available to be examined by any interested party. There has been made a description of written music as looking like hen scratches and fly specks. It is kind of magic to people who can’t read it. Champion Souvenir copies of MAY THE GOOD LORD BLESS AND KEEP YOU are available at Henson’s Store in Beautiful Downtown Champion. Mrs. Eva Powell is happy to have her daughter home again after her recent adventures out west. She and her husband explored gold mines and desert towns and big lakes and dams. They had fun but were glad to get home. Many Champions have family out traveling. The world is a dangerous place and loved ones far from home pass through the good thoughts of home folks during course of the day. Worry is a waste of time. “May the Good Lord bless and keep you, whether near or far away.” Family and friends of distant travelers and US Service People abroad hold them close in their hearts with hopes for safe and speedy returns of all those precious ones. They are full of Love and Gratitude. Kyle Alexander Barker was visiting with his old Grandfather and his young Grandmother on Sunday. His favorite flavor of ice cream hasn’t been determined yet, but it won’t be long. Ice cream preferences, songs, stories, parade reviews, and reports of happy homecomings are welcome at Champion Items, Rt. 2, Box 367, Norwood, MO 65717, at Champion News and at Henson’s Store in Downtown Champion. The Ladies Auxiliary of the Skyline Area Volunteer Fire Department had their regular meeting on Tuesday at the home of Esther Wrinkles. The recent chili supper was discussed and plans were made to make next year’s event even better. The immediate business at hand is the Bluegrass Festival that will be held at the Wagon Wheel Bluegrass Park the first week end in June. The Auxiliary will be providing the food for the event and plans are in the works. Good planning is responsible for the wonderful successes of the Auxiliary projects. Time is getting away! The early change in the daylight savings time is a headache to some. Some don’t worry about it at all. The “Ides of March” is Thursday. Some say, “Beware!” Others don’t care. The Luck of the Irish will be spread around Champion over the week end. May it last the whole year through! It will be met with Love and Gratitude. The delightful news out of Champion this week has been the weather. If it were like this all the time Champions could not find a spot to light for all the tourists. As it is, the ticks and chiggers, the hail storms, cyclones, tornadoes, floods, droughts, heat waves and blizzards kind of keep things balanced out. A local Hero and well known Mushroom Hunter was heard to say that in a week or two, if we get some warm nights, we can start looking (for mushrooms) with expectations of success. The dogwoods are swelling up to bud, and all is well. Champions Love the daffodils and the sweet Spring green. This is the cover of the Sheet Music that arrived from the on-line web-site that specializes in collectables: MomThrewItAway.com. The official words to MY MISSOURI HOME are very much like those recalled last week by Darrell Haden. The official words are: “Dear old Missouri, I know, You mothered me long ago. You are my own, I should have known, That I’d be missing you so. My Missouri Home, My Missouri Home, Let me show you why I’m so blue; I just long to be with folks I long to see, who still belong to me and you. 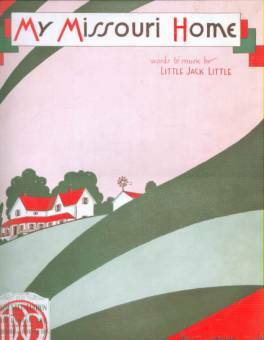 Old Missouri farms, Take me in your arms, Hold me so I never can roam, Open up your doorway, For I’m coming your way, My Missouri Home!” It is a waltz moderato and was written by Little Jack Little and published in 1930. A band made up of piano, alto and B-flat tenor saxophones, ukuleles, guitars, tenor banjos and Hawaiian steel guitars could all use this same piece of sheet music. Any musicians interested in viewing this excellent ‘collectable’ should contact Champion Items, Rt. 2 Box 367, Norwood, MO. 65717, or should e-mail to Champion News or leave word at Henson’s Store in Downtown Champion. Copies of the words and guitar tablature to MAY THE GOOD LORD BLESS AND KEEP YOU are also being made available as a Champion Souvenir. Ask at the store or contact the address above. “May your heart stay tuned music, that will cheer the hearts of men.” That’s a Champion motto! A Champion Idea heard recently is: “Those wounded Veterans should be able to go to just any hospital anywhere and get good treatment. The hospital could bill the VA the way they do Medicare. There would still be plenty room for the ubiquitous corruption and ineptitude, but maybe a few more Veterans would actually get the help they have coming.” As of March 12, there have been 3194 US Service People who have lost their lives in the current conflict. The number of seriously wounded and otherwise damaged personnel may never be known. “Sassefrass, that good old yaller tea! Sassefrass, it’s good for you and me. If it put pep in my Grandpap, it’ll put pep in you too! Sassefrass, that good old southern brew. Oh! They dig it in the hollers and they dig it in the hills. The drink it for the fever and they drink it for the chills.” That is all that has been reported of this song except a partial verse that says “And when they failed to get enough, they began to fight.” Once all its lyrics are rediscovered it will be added to The Missouri Song List. Meanwhile, it’s that time of the year when people are looking for the Spring Tonic. They say that sassafras is a good blood purifier and it can be brewed to taste pretty good. It is reminiscent of ‘root beer’ and probably the source of ‘sarsaparilla.’ Some say it should be strictly used as a ‘tonic’ and not to be a regular drink on account of its blood thinning and ‘purifying’ qualities and its possible effect on the liver and kidneys. Still, it is getting on to Spring and some may be ready for their tonic. The other day some folks were talking about gardening by the signs. Over in Norwood Linda’s almanac says that the 15th & 16th are barren days. The 17th good for planting root crops and the 18th for above-ground crops. The 19th & 20th are not good for planting, and that the 21st and 22nd will be good for planting above-ground crops. It’s a long time until the signs change and one fellow said he would just sit down and wait! The almanacs are free and full of good information. Flowers, herbs and home grown food can’t be beat. These same folks were talking about something called “Ugly Farming.” It has something to do with not tilling the soil. There is a song about it that ought to be informative if it can be found. A pleasant conversation with Tony Evans, now of Ozark, MO, clears up some information that appeared here back in October. He says the store at ‘Evans’ was first built by Lee Evans and was located at about the place where the Dobbs family lives now which is about a quarter mile west of where the store last stood. No details of ‘how’ the store was moved were available, but Mr. Evans said that his sister, Joyce, was born in the store in 1932. His Grandfather Thomas Luther Evans had the stave-mill at Evans and had donated the land and material to build the church there. The church was built by a Mr. Lathum. Mr. Evans says that his Aunt Erma Evans, who was the wife of Curtis Evans, brother of Lee Evans, still lives in Ava and will have all kinds of family history to share. Champions look forward to learning more about their neighbors. It’s not that they are so nosey, they are just interested. Points of interest, ‘bright ideas,’ songs, sayings, eagle sightings and signs are welcome at Champion Items, Rt. 2 Box 367 Norwood, MO 65717 or at Champion News. Last week the Champion Items appeared on the page with the pictures of the Chamber of Commerce Ladies at their February 17th banquet modeling dresses that had been made for the Centennial celebration of 1957 and for the nation’s Bicentennial celebration in 1976. They are lovely, though even the most simple of the day dresses looks like a lot of yard goods to keep out of the mud, or the pig trough, or just to get around in the barn and in and out of wagons. Appreciators of the old ways and the old days also appreciate the automatic washing machine and plumbing. Darrell Haden remarked in his recent note that he is enjoying Mr. Curry’s Reminiscent History of Douglas County. He said that he had bought a copy of it in 1957 for five dollars “when five dollars was worth almost five dollars!” Excitement will be building for the Douglas County Sesquicentennial Celebration. Beards are already sprouting. Hopefully the spirit of the festivities will carry through the whole year and the Skyline and other community picnics will find attendees wearing period costumes this summer. Then will come the fall and the Pioneer Settler’s Reunion over in Yates. More than one person is hoping that a serial reprint will be running in the Herald of The Headless Cobbler of Smallet Cave. Perhaps Champions will be able to lure Mr. Haden home for the Finale! It’s a small world. If the crow were to fly a straight line between Champion and Smallette it would be about……miles according to the ………………map. It’s only about …………miles as the crow flies to Spotted Hog. The News of Our Military Personnel reported in the Herald is most welcome. Everything that keeps our service people in our thoughts is good. Most week day evenings at about 6:50 p.m. the News Hour With Jim Leher on Channel 21 TV gives a silent memorial to the fallen. They are shown as their deaths are made official and as pictures become available. Most evenings there are ten or twelve. It is an honor to see their optimistic faces so dedicated to duty. It was recently reported by Bob Woodruff of ABC News that during the Viet Nam War there were three seriously injured soldiers for every fatality. Now they are saying that there are sixteen seriously wounded people for every fatality. Bless their hearts and the hearts of all their loved ones. It is a tribute to better armor and to better medical technology that fewer people are dying. That any are dying is a heartbreak for those they leave behind. Those Champions who survive don’t need their hearts broken too. They are our neighbors. Now we are all looking for Peace Valley.